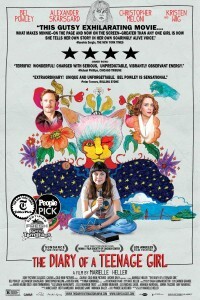 THE DIARY OF A TEENAGE GIRL is based on Phoebe Gloeckner’s novel of the same name, hailed by Salon as “one of the most brutally honest, shocking, tender and beautiful portrayals of growing up female in America.” Writer/Director Marielle Heller unlocks this diary with a richly comedic and deeply personal vision. It is a coming of age story that is as poignant as it is unsettling. Set in 1976 San Francisco, THE DIARY OF A TEENAGE GIRL begins at the crossroads of the fading hippie movement and the dawn of punk rock. Like most teenage girls, Minnie Goetze (Bel Powley) is longing for love, acceptance and a sense of purpose in the world. Minnie begins a complex love affair with her mother’s (Kristen Wiig) boyfriend, “the handsomest man in the world,” Monroe (Alexander Skarsgård). What follows is a sharp, funny and provocative account of one girl’s sexual and artistic awakening, without judgment. Minnie emerges defiant— taking command of her sexuality and drawing on her newfound creative talents to reveal truths in the kind of intimate and vivid detail that can only be found in the pages of a teenage girl’s diary. In her feature film directorial debut, director / writer Heller brings Gloeckner’s book to life through fearless performances, inventive graphic novel-like animation sequences, imagination, humor and heart. This entry was posted in adaptation, animation, comedy, drama, dramedy, Film School interview, Indie, Music, Spirit Award nominee by admin. Bookmark the permalink.